Raphaella plays Jorge MOREL, Augustin Mangore BARRIOS, Joaquin TURINA, Franz BURKHART, Richard Rodney BENNETT and Frank MARTIN. The Argentinian Jorge Morel (1931), virtuoso and composer, who has been influenced by western music and South American folklore, can be considered as the successor of Barrios. The Sonatina, which opens this CD, is dedicated to David Russell. The Paraguayen Augustin Mangore Barrios (1885-1944) was unquestionably the most colourful guitarist from the beginning of the 20th century. Dressed in an Indian costume with a feather head-dress, 'Chief Nitsuga Mangore' performed Bach, Sor, Tarrega and Albéniz. He called himself 'the Paganini of the guitar from the jungle of Paraguay'. The Sevillian Joaquin Turina (1882-1949) was one of the first composers to respond to the wish of Andres Segovia to write more works for the guitar. Together with Albeniz, Granados and De Falla, he represented the nationalist school of Spanish music. The Austrian Franz Burkhart (1902-1978) wrote the Passacaglia inspired by the baroque. It is an example of how the variations on a bass of the 17th century can be applied in a neo-classical context. The British Sir Richard Rodney Bennett (1936) has written these five Impromptus in 1968 at guitarist Julian Bream's request to several British composers to expand both the guitar repertoire and the instrument's possibilities beyond the styles and conventions of Spanish guitar music. Yet it is odd to note how they turned, almost reflexively, to Spanish music for inspiration. The Suiss Frank Martin (1890-1974) offered this four-part piece to Andres Segovia in 1933. The latter however never played it. In 1953 in caught the attention of Karl Scheit who made his own arragements. Raphaella has used the manuscript of Frank Martin (with a few alterations based on his piano version). "From the opening notes to the end, this disc is a winner. This is indeed the playing which can take the guitar into the 21st century, with this quality of musicianship the instrument would soon lose its poor relation tag. Wonderful programme, wonderful playing. Thank you Ms. Smits." "I'm not familiar with Raphaella Smits, but she's better than nearly every woman in the guitar field. Smits could show them a thing or two about lyricism and sentiment. Martin's 'Quatre Pieces brêves' ranks right up there with the best on disc thus far. When hearing Smits perform the work, it's hard to understand why Segovia rejected these attractive miniatures." "Smits's performance of the set is uncommonly penetrating, and she does see through some thorns to the lyrical heart of the music. It's a triumph. The most essential matter is what we hear, and that is truly fine: excellent performances of mostly excellent music, quite realistically recorded. This recital is highly recommended, and I will be looking for more from Smits." "Anyone not acquainted with this music will do well to hear Smits with both her power and passion, and her reflective capability. Altogether a CD to enjoy. The music never once sounds anything other than grand." "Raphaella Smits plays with the greatest subtlety, if not the greatest of serene warmth which for much of this music is just fine." "Raphaella Smits possède un argument majeur pour séduire: sa sonorité. A la fois ample, fin et précis, ce son-là n'est pas loin d'être un exemple." "Tonlich akkurat, sensibel und geschmackvoll in ihrer Wahl der Tempi wie in der agogischen Gestaltung, bringt die Gitarristin gefühlshaften Ausdruck und spieltechnische Meisterschaft wirkungsvoll ins Lot. Vor allem ihr warmer, schwingender, dabei präzise fixierter Ton fasziniert. Über Raphaella Smits wünßte man gern mehr - doch das Booklet schweigt sich aus." 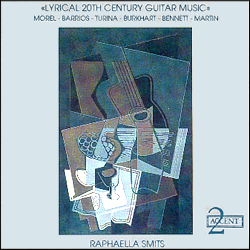 "Die Platte mit "Lyrical 20th Century Music" von Raphaella Smits ist eine Neuerscheinung, die ich empfehlen kann! Da sind musikalische Interpretationen mit Klangsinnlichkeit und Virtuosität zu hören, mit Witz und Lyrik ... mit Saft und Kraft eben." "Raphaella Smits, with major elegance, plays with timbre and uses virtuosity as factors of aesthetic ornamentation. A very interesting recording."